The Boeing 747-400, designed as a development of the Boeing 747-300, sees improvements in an increased wing span, more powerful engines and the latest in-flight entertainment systems. The B747-400, best known as the world's fastest commercial jetliner, has the capability of carrying up to 660 passengers in a partial double deck configuration. The iconic Boeing 747 has been in production since 1968, and is one of the longest lasting wide body aircraft in existence. With 1,500 Boeing 747's still in existence as of 2015, this wide body aircraft has become synonomus with the image of international travel. 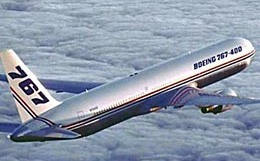 Since 1968 Boeing has expanded the 747 family line to include several variants with differing cabin sizes, performance, and features. They have also created a freight model, with a easy access nose door. Currently this aircraft is still in service with numerous governments, airlines, and is currently being used as Air Force One for the U.S. Government. Production on the Boeing 747-400 started in 1988 and ended in 2009. 694 aircraft have been built so far. Twin decks, lounge areas, and piano bars. Those were the standard luxury amenities that served to differentiate one airline from another during the era where price was fixed, but service was not. The Boeing 747's transformation over the years, has gone from customer focused amenities such as piano bars, smoking lounges, and onboard lounges, to high density seating where getting as many passengers onboard is the new priority for most airlines. Cabin features have morphed from the boxy designs of the 1960's and 70's to the sleek elegant interiors of the modern day, replete with accent lighting, expanded overhead bin space, and personal entertainment systems. 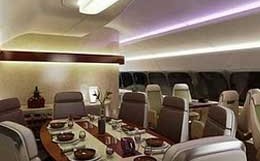 Even though the Boeing 747 has morphed several times over the years, the aircraft is still synonymous with luxury, and exotic far away travel. The cabin can support, depending on the variant and configuration, between 412, and 605 passengers. The Boeing 747 is one of the fastest airliners in the world with a maximum Mach speed of .92, or 614 miles per hour. The aircraft also has a massive maximum take off weight of 875,000 with the 747-400, and 987,000 lbs with the freighter variant. The range of the 747 is comparable to that of its younger sister the 777, with a maximum range between 6,100 to 9,200 depending on the variant of 747. 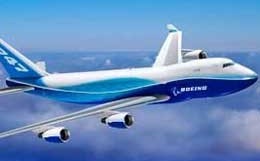 For more information about chartering, leasing or buying a Boeing 747-400 please contact us by calling +44-20-3874-8091 or send us an email here.